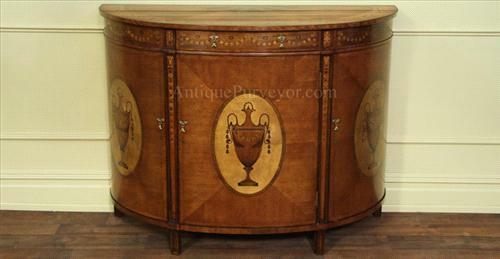 High-End Traditional Furniture Store with Worldwide Shipping. 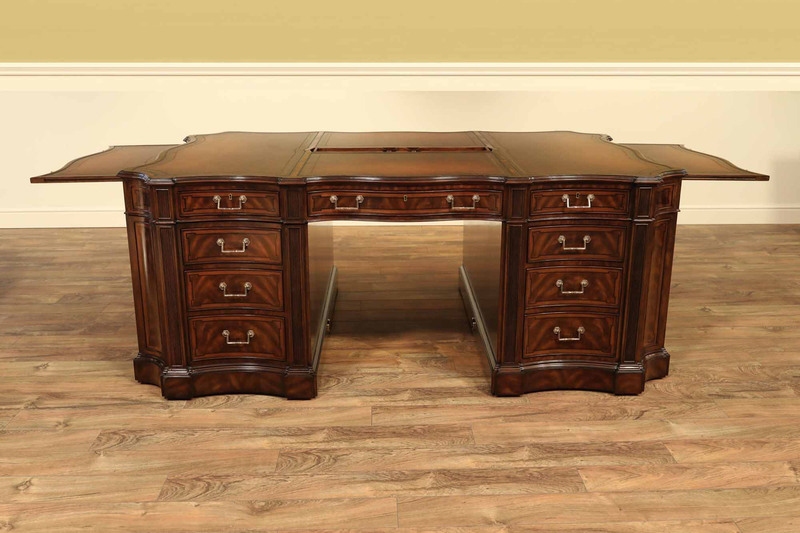 Mahogany Dining Room Tables and Chairs, Executive Desks and Casegoods. Hard-to-Find Expansive Tables For Seating 12 to 20+ People. 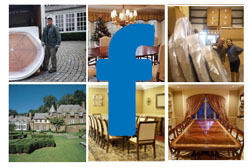 Browse our furniture store online or visit our store in New Milford, Connecticut (by appointment). 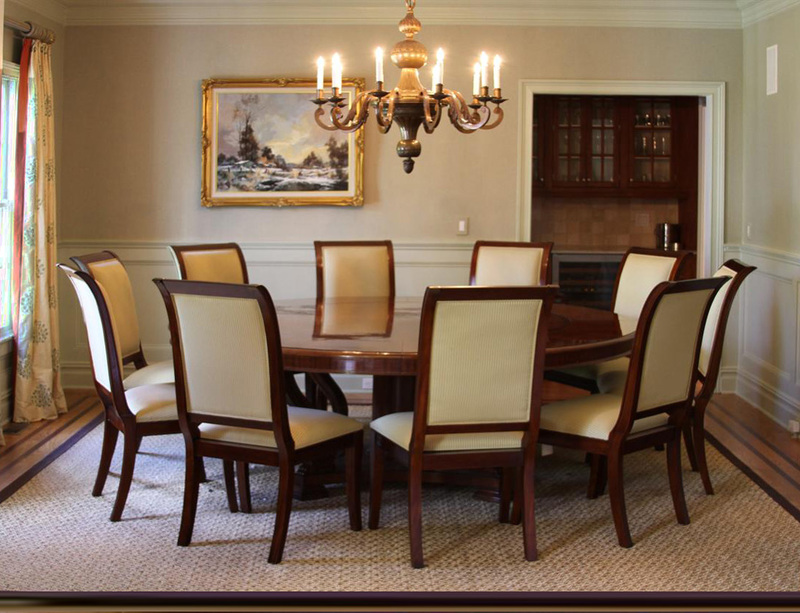 High-end mahogany and walnut traditional and transitional dining room tables, chairs, and cabinetry. 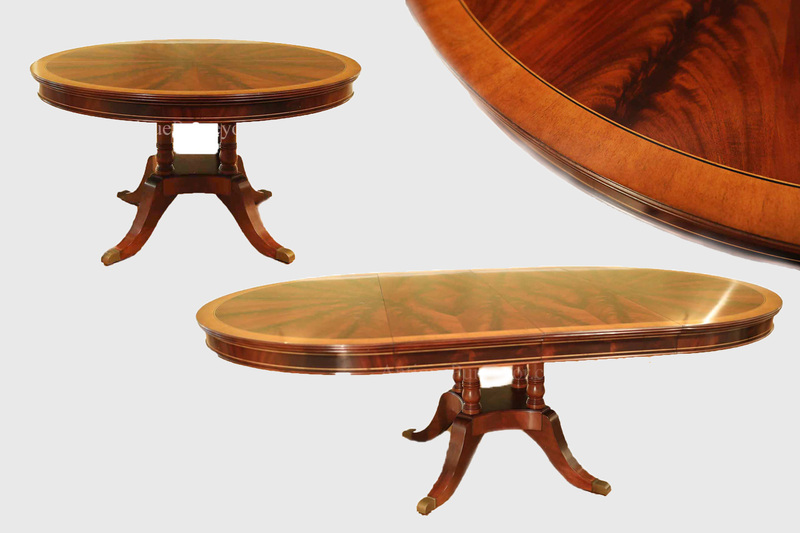 Inlaid dining tables and difficult to find oversized tables are our specialty. 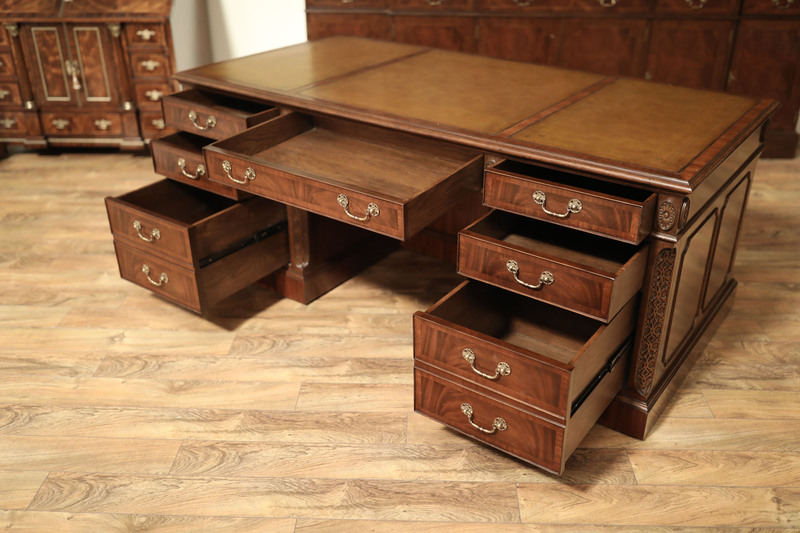 Fine traditional office furniture including leather top desks, credenzas and bookcases are also available. 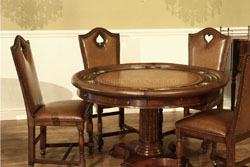 Ask about our fine American made custom table program as well. 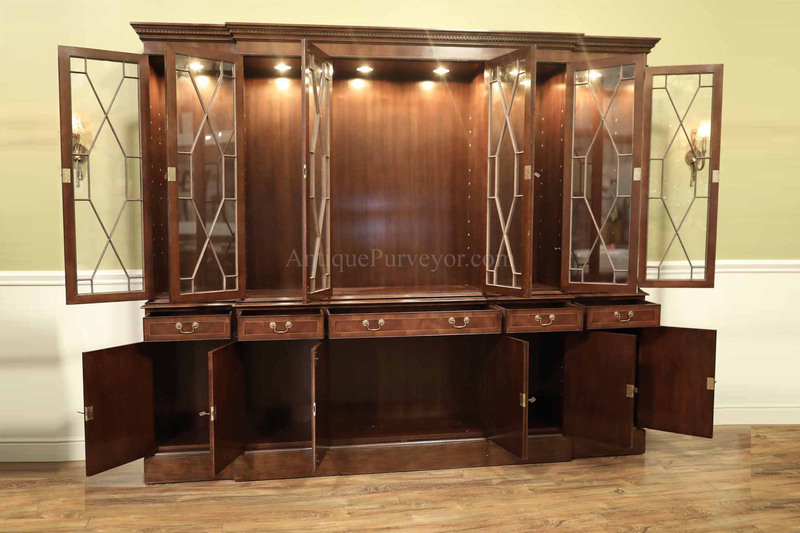 Furniture superstore with generous inventory and plentiful stock ready for shipping. 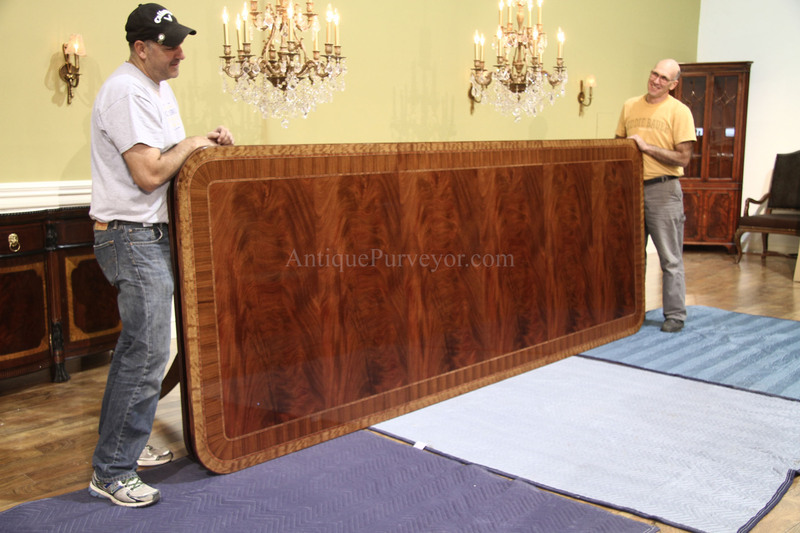 AntiquePurveyor.com is proud to announce a new collection of dining room tables designed for any size traditional dining area for any size home. We call this collection, “Custom Fit Classics”. 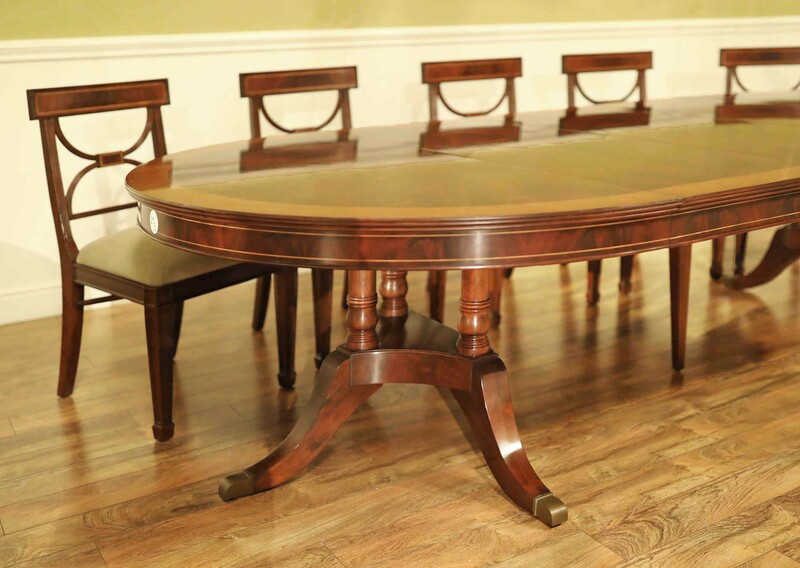 This collection of dining tables focuses on fitting your traditional space with beautiful crotch mahogany tables and chairs in a wide variety of sizes and configurations, so we’ve got you covered whether you are furnishing a small dinette or an expansive dining room. 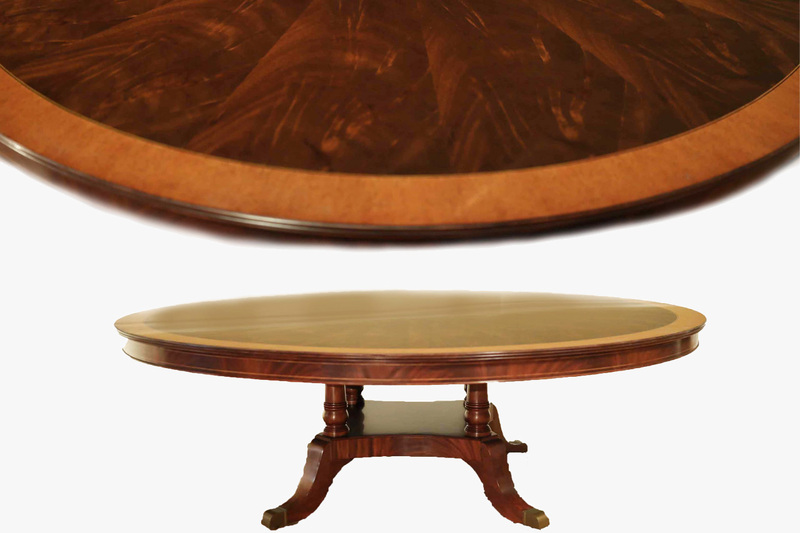 There is little need for a custom table after considering these options. 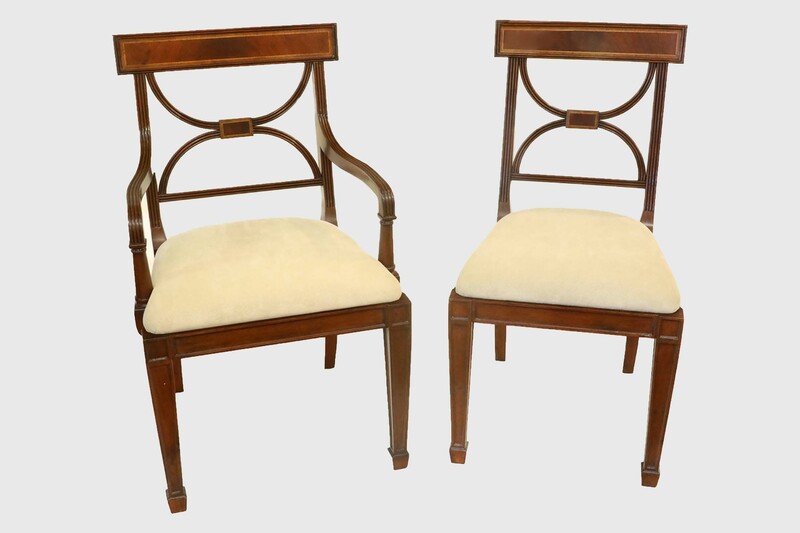 This collection of table and chairs was designed with our New England client base in mind. 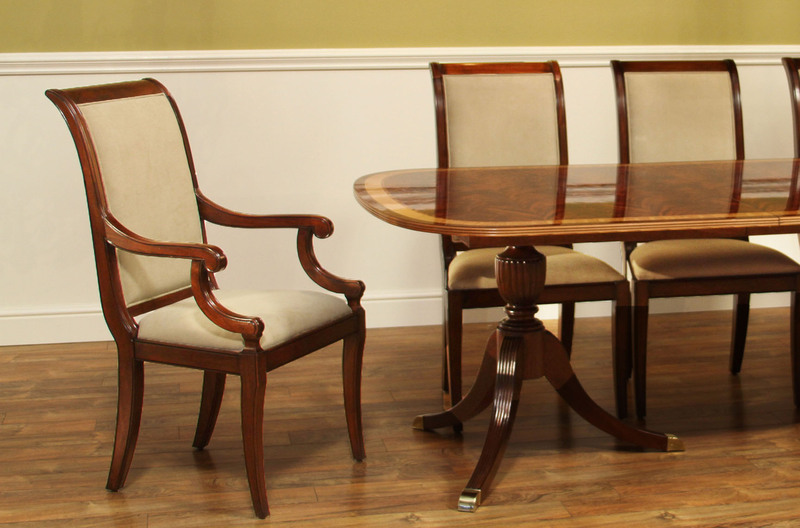 During our 15 years of selling traditional mahogany furniture, we’ve listened to hundreds of client’s feedbacks while they shop in our studio and have tailored this collection around the most widely accepted veneers, colors, pedestal styles and even foot details. 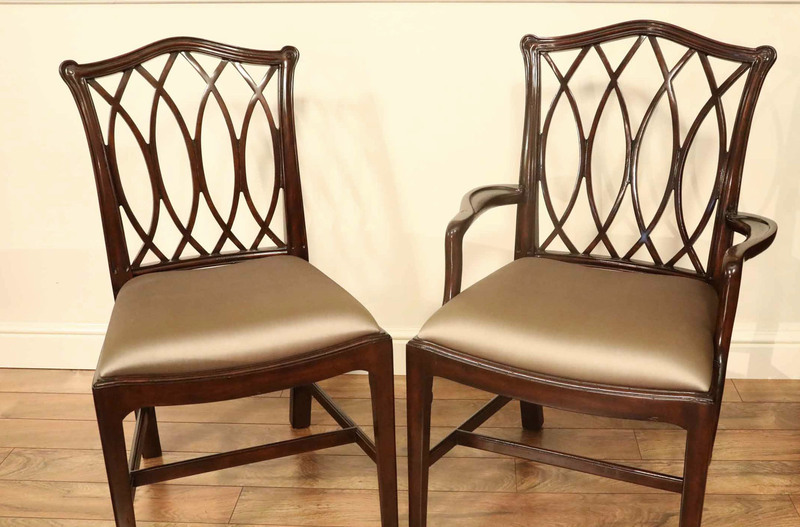 This collection boasts classic styles with subdued inlays and top of the line quality. 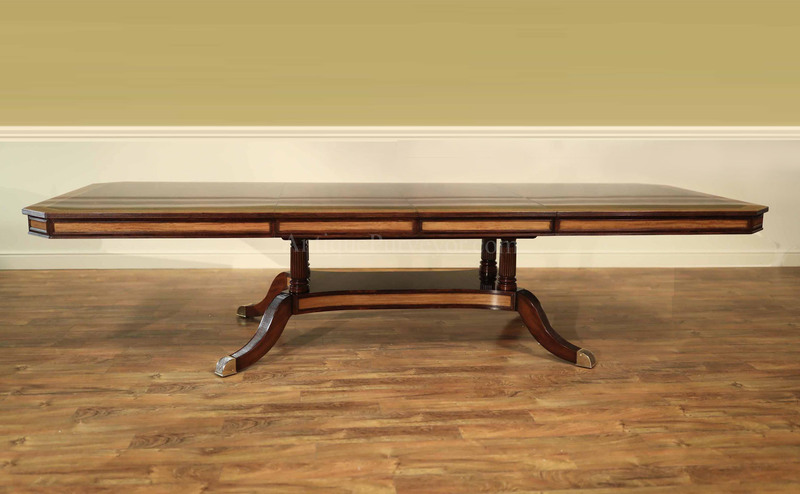 This furniture doesn’t just look fantastic, it is well engineered and because we are well educated and informed of the manufacturing processes and have an open line of communication with the factory and its owner, we know firsthand what processes have gone into every table and every component. 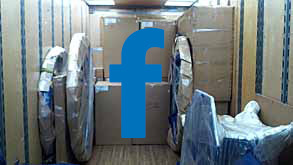 For example, every piece of hardware within this collection if forged in-house and there are no cheap components. 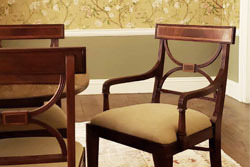 Every screw, each brass caster and all hardware is manufactured in-house. I traveled across the world with my family to witness these processes and to meet the mastermind behind it all. It was an amazing experience and we are proud to offer this collection for your consideration. 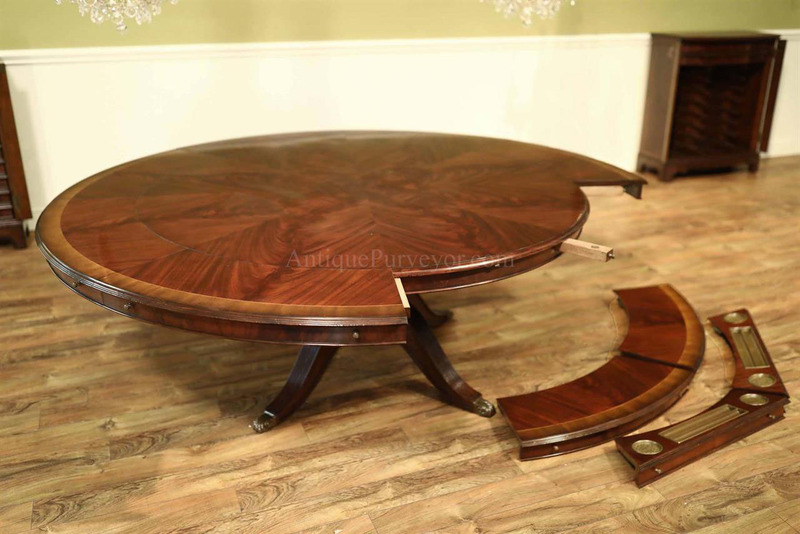 Crotch mahogany is beautiful and this collection shows it off well. Crotch mahogany is also very difficult to work with. This manufacturer has a proprietary solution which is used to remove tannins and oils from the raw material. After the cleansing process the Veneers are pressed flat before finally laying them on table tops. Crotch mahogany is beautiful, but it is very time consuming to do it correctly. 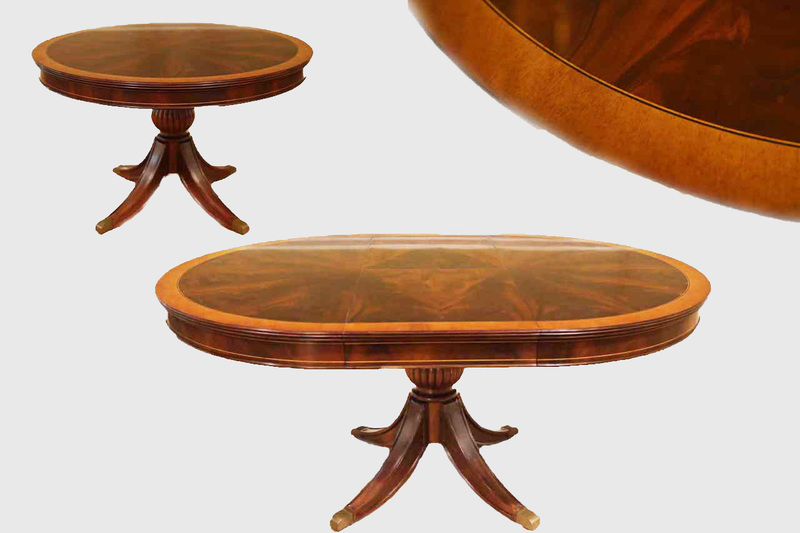 Crotch mahogany has a tendency to creep back to its original shape after pressing which can create havoc under a finish. 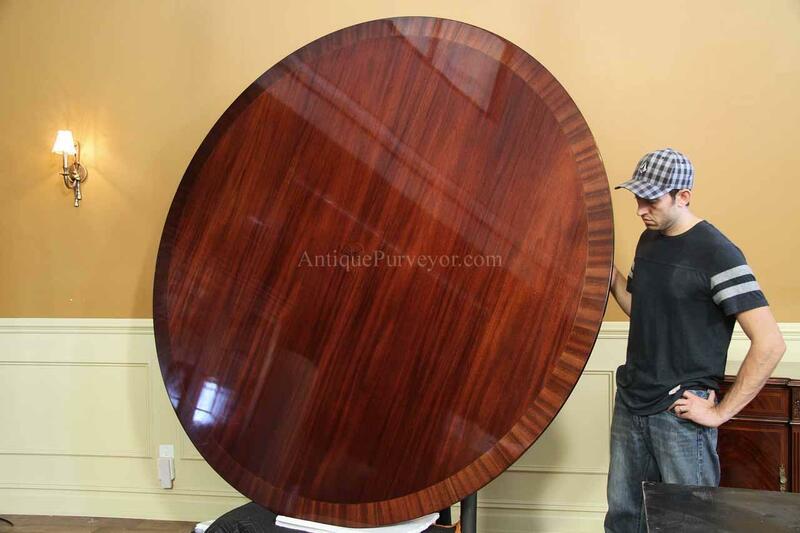 I only know of a few factories that can process crotch mahogany and finish it correctly and whose product has passed the test of time.